I wonder if any of you know about any English translations of this poem. I have tried to translate it into German, although I suspect that there must be at least one translation already, otherwise why would they choose this particular poem? The ‘dust’ in the poem is in plural, like dust particles. In German, I think I would stick to ‘Staub’, which doesn’t have a plural, just like ‘dust’. There is ‘Stäubchen’, which can be pluralized, but I’m not sure if I could use it well for this poem. and on thousands of other websites. I am pretty sure they do mean this particular poem. The readings are suggested to take place on March 20 – does that have anything to do with Easter, maybe? Or maybe the date just happens to be this year’s date of their international reading festival. They had a similar appeal for readings with texts by Liao Yiwu, which was also presented on this list. There was a rather significant echo. Many famous writers read Liao’s works, among them Nobel laureate Elfriede Jelinek in Austria. In Liu’s case, December 28 (his birthday) would be a good date for a reading. But Lent or Easter do fit well with the poem. Hier ist noch ein Link zu einem längeren Artikel über zwei Bücher. Erinnerungskultur, Vergangenheitsbewältigung etc. sind nicht nur in Österreich, sondern auch in China seit längerem besonders aktuell. Thanks for the translation! As you probably now know, our English translation has been widely distributed on the Internet and was read in 34 countries round the world on Sunday 20th March with Liu Xiaobo’s Charter 08. the translation has also been widely re-translated: into Afrikaans, Arabic, Macedonian, Spanish, French, Dutch, Russian, Romanian, Bosnian, Swahili, and more – including, of course, German. We also translated a shorter poem, which was broadcast on the BBC World Service (The Strand, 3rd Nov 2011), and it was this that led to the Berlin Festival and Authors for Peace contacting us and including our translation both in their petition last year and in the readings that took place in March. 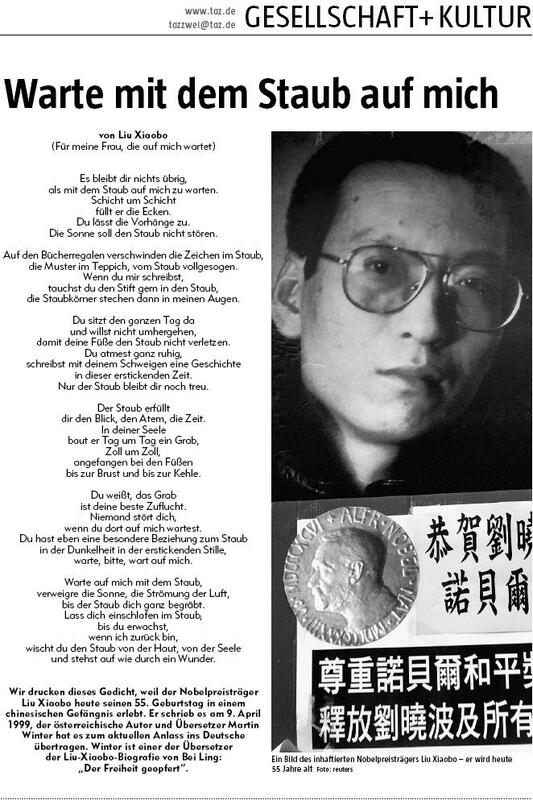 Thanks so much for your work on this, and for adding your voice to calls for the freedom of Liu Xiaobo. Im Rahmen einer Ausstellung mit dem Titel “Bücherhimmel – Bücherhöllen” (Museum Strauhof, Zürich, 19.9-25.11.2012) würde ich Ihre Übersetzung von “Warte mit dem Staub…” gerne als kleines Wandbild zeigen: im Raum der Zensur und der Büchervernichtung. Ich würde mich freuen, wenn Sie dafür Ihre Einwilligung gäben. Das Gedicht, etwa im A3-Format, schlösse sich an eine Reihe von Zensurlisten an – gewissermassen als Zeuge der anhaltenden Bücherverbote.